The Police were an English rock band from London, formed in 1977. The band consisted of Sting (lead vocals, bass guitar), Andy Summers (guitar, vocals) and Stewart Copeland (drums, vocals, percussion). 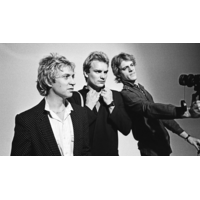 The Police became globally popular in the late 1970s and are generally regarded as one of the first New Wave groups to achieve mainstream success, playing a style of rock that was influenced by jazz, punk and reggae music. Their 1983 album, Synchronicity, was number one in the UK and the US and sold over 8,000,000 copies in the US. The band broke up in 1984, but reunited in early 2007 for a one-off world tour lasting until August 2008, in celebration of the 30th anniversary of their hit single "Roxanne" and also, to a lesser extent, their formation as a group. The Police have sold more than 50 million albums worldwide, and became the world's highest-earning musicians in 2008, thanks to their reunion tour.